If you’re learning French, you’ve probably found yourself looking for French films or Youtube videos to watch on your spare time. That’s an excellent thing to do, both to get connected to French life and culture and to learn “real-life” French (as you may have noticed, spoken French can be quite confusing when you’re coming from textbooks!). In practice, however, improving your French with films and videos on your own isn’t as easy as it seems. You may need the help of subtitles and find that these are not available, or that they are of poor quality. To learn effectively, you should keep a dictionary, a pen and a notebook at hand. You should also choose videos that are appropriate for your language level. All of this requires time and effort. We offer a solution to this problem: ILINI, our website for learning French with real-life videos. On Ilini, you can watch short videos with interactive subtitles and tools that help you learn French in a fun and natural way. But what if you want to watch full movies on a giant screen, with popcorn and friends? Being cinephiles ourselves, we were excited to discover Lost in Frenchlation, an organization that hosts screenings of French films with English subtitles at independent cinemas in Paris. A fantastic opportunity for English speakers to overcome the language barrier and discover the world of French cinema! We wanted to find out more, so we got in touch with Lost in Frenchlation’s co-founder Manon Kerjean to ask her a few questions. Manon tells us about the origins of Lost in Frenchlation, the format of their events, the help they provide to language learners and their future plans. Manon, can you tell us a bit about you and how you started Lost in Frenchlation? How did you get the idea? Lost in Frenchlation was born out of the frustration that Matt and I felt when we could never go to the cinema together to see the French films advertised all over Paris. While I’m French, Matt is Australian and his French is… developing! We met while studying in Berlin, and when we came back to Paris, we searched every cinema to try to find French movies with English subtitles but had no luck. That’s when we realised that we mustn’t be the only ones feeling this frustration because of the language barrier – there’s a huge international community wanting to experience every aspect of French culture possible, and that’s who we’re trying to cater to. We want everyone to be able to experience French films just like the Parisians do – at the cinema. 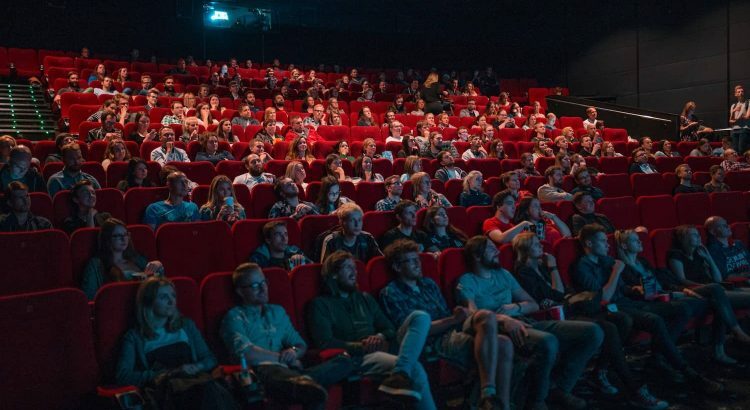 Your movie projections usually start with a drink, which is great to meet other French learners, expats, cinephiles… Do all events follow the same format? 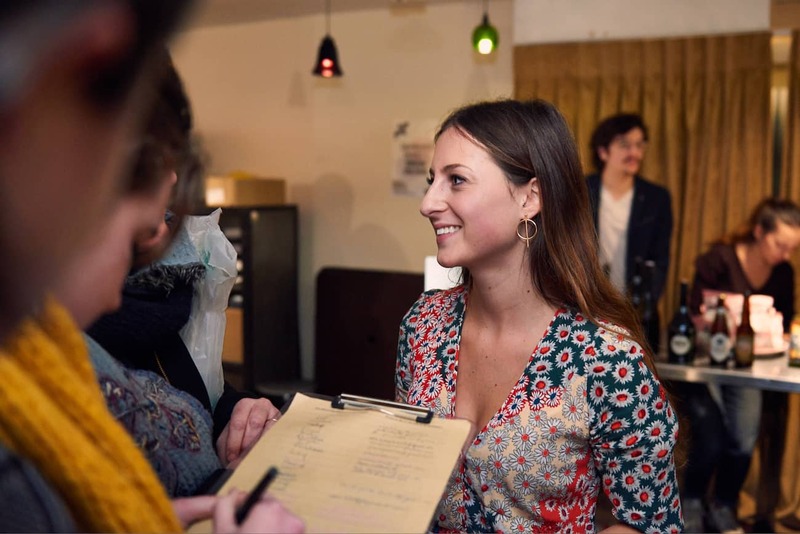 Every screening starts with a cocktail hour – we think that the social aspect of our events is just as important as the cultural experience of discovering French film and watching it together with others from similar backgrounds. As often as possible, we try to make our events even more special by getting the film crew to come and present the movie to our audience and discuss it during a Q&A session (in Franglish!). We also organise other fun entertainment to run alongside the films, like mini-concerts, exhibitions or shows (dance, for example) when there is a link with the movie. And once a month, we run ‘Comedy Nights’ – a stand-up comedy show in English before our selected French comedy with English subtitles. These are a massive hit! Do you provide other services to help people learn French with French movies? Outside of our public events, we offer private screenings to school groups and language schools where we provide the audience with movie leaflets including French vocabulary, quizzes and anecdotes about the film (and a movie poster!). Some of these screenings are in French with French subtitles, depending on the group’s language level. How many events do you have every month? Where do they take place? We have 4 to 8 public events a month, held once or twice a week, in one of our three amazing partner cinemas: Club de L’Étoile, the most beautiful cinema room in Paris, located just a few steps away from Champs-Élysées; Luminor Hôtel de Ville, in the heart of Le Marais; and Studio 28 in Montmartre, the oldest cinema in Paris, where the movie Amélie was shot. How do you select the movies? Are there certain types of French movies that are more popular than others? We screen a variety of genres – comedies, thrillers, dramas etc. – and for now there hasn’t been any favorite type of film, it just depends on if we think its what our audience would like to see. We do try to show what is popular amongst the French community though, to give the international community an opportunity to participate in discussions about these films in their work environments etc. In a nutshell, we just try to provide our audience with what we think is the best of French cinema! Who is your audience? Expats, tourists…? Our audience is a big melting-pot of expats who recently arrived or have been here for several years but still haven’t mastered French; international students looking for a fun social event (or ‘Erasmus’); tourists looking to experience a more genuine aspect of French culture; and French people who want to practice their English by reading the subtitles and making new English speaking friends (a minority, but a really important part of our community!). We’re taking a break over the summer but will be back on August 24 with our annual free outdoor screening! This time we chose to screen 2 French short-movies and the classic cult film ‘La Reine Margot’. And at la rentrée we’ll come back with a tonne of exciting events! We’ll be participating at a number of non-LiF events, like the European Art Cinema Day; Black History Month with a movie called ‘Ouvrir la Voix’; and at the Télérama festival, we’ll raise awareness around the refugee cause with a special event in collaboration with Serve the City Paris. For our own events, we’ll program a dance film coupled with a dance show; we’ll celebrate our 100th screening; and we’ll have more comedy nights, thrillers, and in typical French style, dramas!